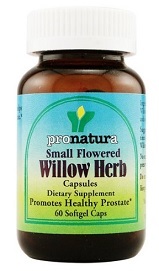 If you are interested in protecting your prostate and giving it the nutrients it needs to stay healthy and strong, try ProNatura's Small Flowered Willow Herb capsules. Problems with your prostrate can cause irritating and potentially dangerous health problems. Pronatura's Small Flowered Willow Herb Capsules is an effective treatment for all kinds of prostate complaints from simple inflammations to infection. Small Flowered Willow Herb has been used for centuries to relieve urinary and prostate discomforts. Now ProNatura has captured the benefits of Willow Herb in an easy to swallow softgel capsules. Small Flowered Will Herb not only promotes prostate health but also benefits the entire urinary system, including the kidneys and bladder. It also acts as a natural analgesic (pain reliever) which can help with a variety of urinary tract pains. Directions: Take two capsules three times daily, preferably with Small Flowered Willow Herb Tea.